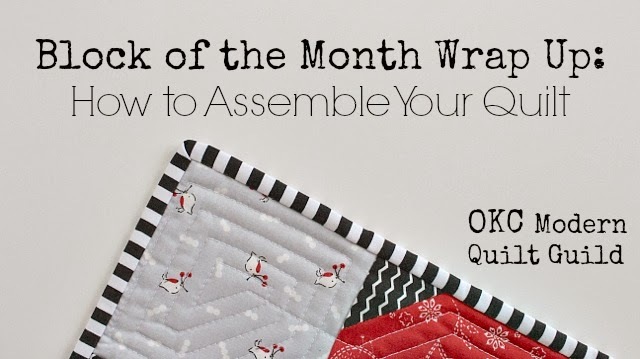 Now that the Block of the Month is complete, it is time to turn that quilt top into a quilt. Here is a quick rundown of the steps to assemble the quilt layers, quilt them, and add the binding. Choose the fabric for the quilt back. 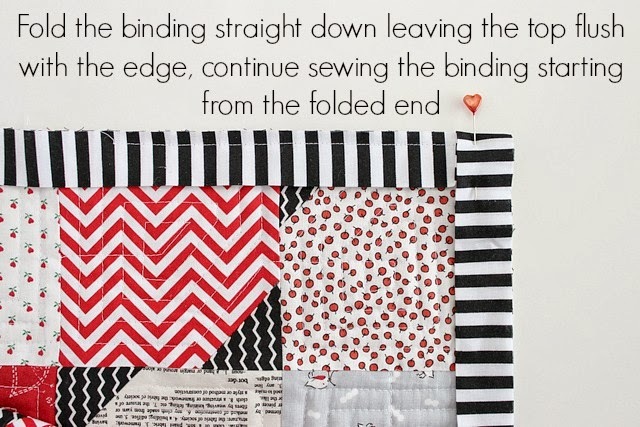 The backing should be 4"-6" larger than the quilt top, meaning 2"-3" of backing should extend past each of the edges of the quilt top. While quilting, the fabric can be "pulled" in some. If the backing is the exact size as the quilt top, when the quilting is complete you may find the backing is actually smaller than the quilt top. More backing is better. Use masking tape to tape the backing right side down. Tape it tight and smooth, but not so tight as to distort the fabric. If there are any seams in the backing, pull tight along the seams and tape in place. 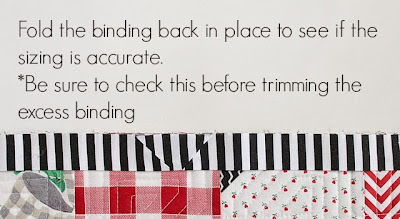 This will help keep them straight when quilting. Once the backing is taped down, add a layer of quilt batting and trim to the size of the backing. Then center the quilt top on top of the batting (right side up) and smooth out any wrinkles. Make sure the seams are straight and neat and start pinning. 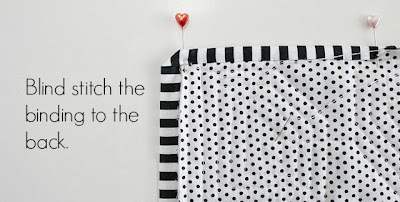 Use safety pins to baste the three layers together and pin every 3" - 5". Press the quilt top and backing with a hot iron and spray starch prior to assembling the layers. Spray the starch on the wrong side to prevent starch build up. The starch helps to give the fabric some body and stiffness and aids in preventing tucks and pulls when machine quilting. It really makes a difference!! Three options for quilting are: free motion quilting, straight line quilting (using a walking foot), or hand quilting. This part is all personal preference. Quilt it however you like, use your imagination and have fun. 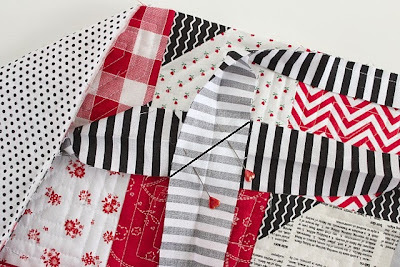 *Roll up the excess quilt to help make it easier to move around under the arm of the sewing machine. 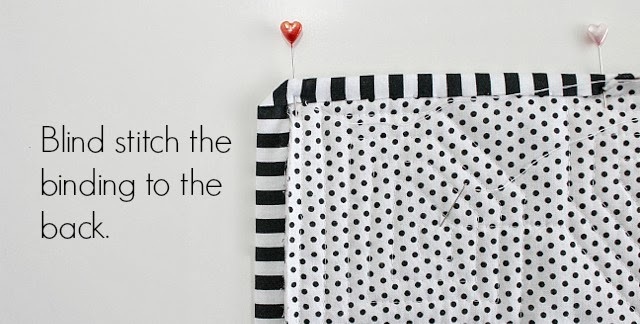 *Stitch length is a matter of personal preference, but a longer stitch length of 3 - 3.5 is a more relaxed stitch and doesn't pinch the fabric as much as the smaller stitches. 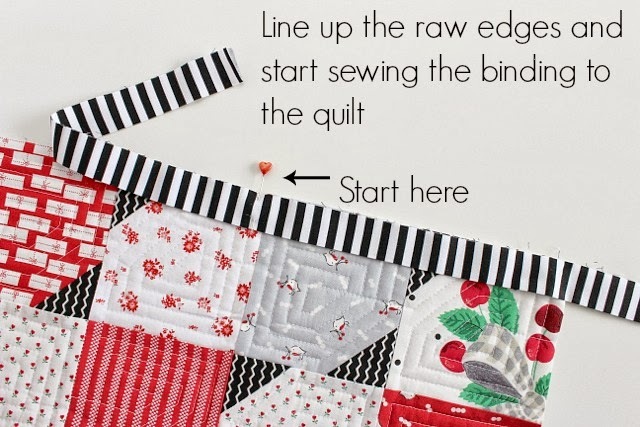 Start quilting with a 1.0 stitch for several stitches to lock in the quilting and then increase the size to the preferred stitch length. 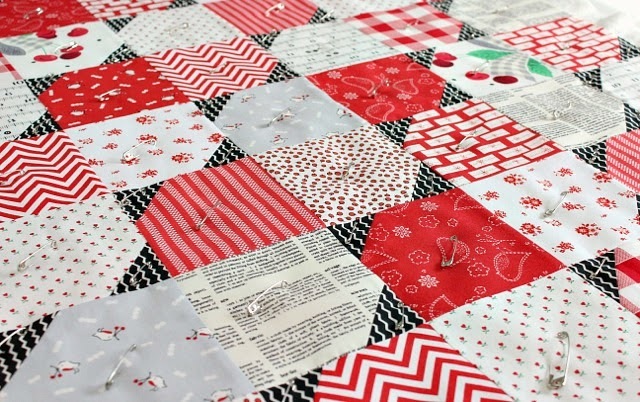 When finished quilting, reduce the stitch length back to 1.0 and stitch several stitches to lock in the final stitches. This will prevent the ends from unraveling. 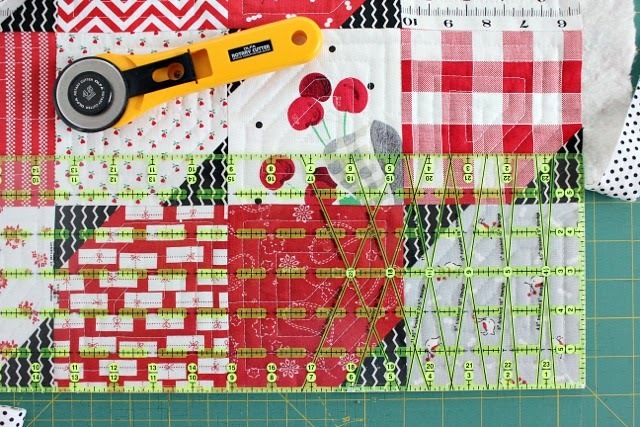 When the quilting is complete, use a ruler and a rotary cutter to trim the edges and square up the corners. 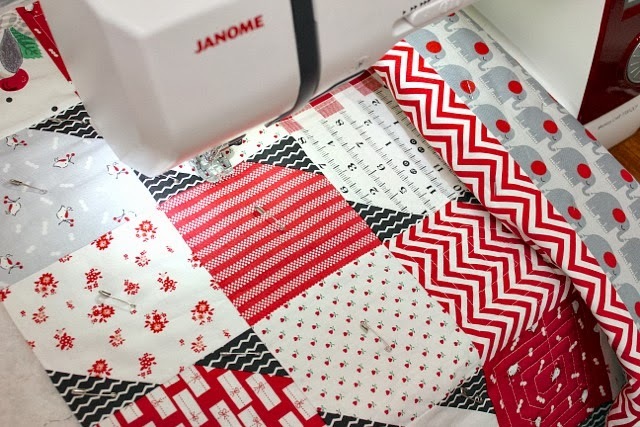 For the length of binding needed, measure and add up all four sides of the completed quilt and add 25 inches to the total. Start sewing the binding on the bottom side about 1/3 of the way in. Leave about 10"-12" of extra binding loose before starting and backstitch at the start. Prevent the layers from shifting by using a walking foot. 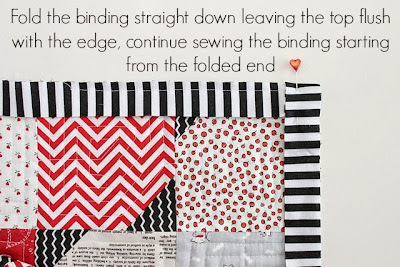 Sew the strips together as demonstrated by the line below. Now your all finished! Congratulations and enjoy your new quilt! A very nice tutorial; thank you. 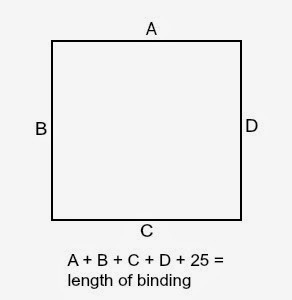 For another way to close the end of your binding see the page of that name on my Web site www.scrap-happy.biz. 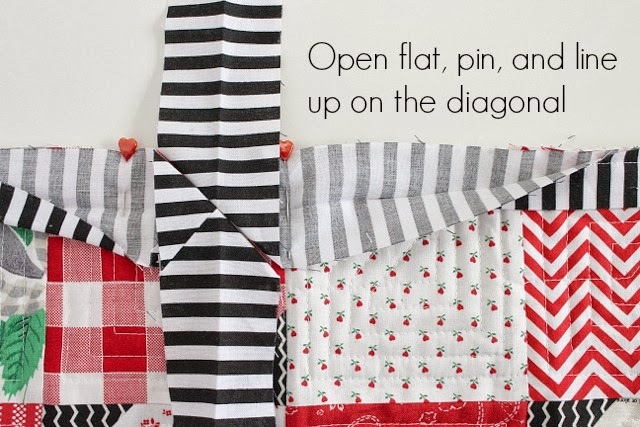 Great tutorial and that quilt is beautiful! 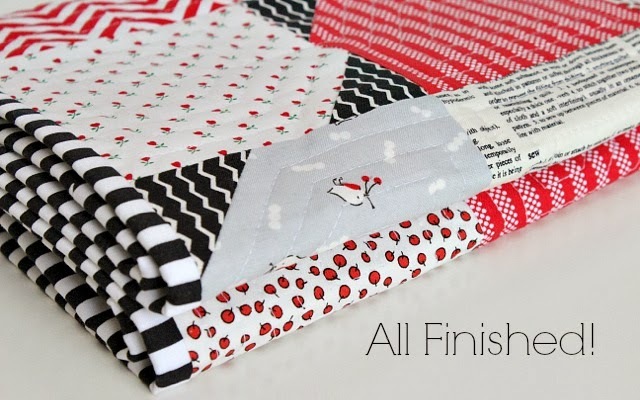 I just finished a red black and white quilt myself.